We come to CES to see the most outlandish and extravagant developments in tech, and few live up to such a description as well as LG Display’s new rollable OLED TV. It’s the successor to 2016’s rollable 18-inch display panel, only now it’s been scaled up to 65 inches and a full 4K resolution. Looking at it up close, I could detect no difference between this rollable panel and LG Display’s other, profoundly gorgeous OLED TVs. 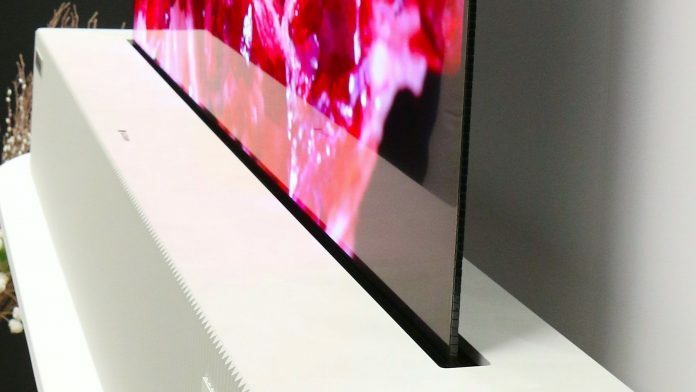 It’s as crisp and vibrant and beautiful as the rest of the company’s OLED portfolio, only it’s that extra bit thinner, allowing it to be rolled down (kinda like a projector screen flipped on its head). LG Display’s demo showed a couple of neat uses of the tech: with the press of a button, the TV would sink down just enough to shift its aspect ratio from 16:9 to the cinematic 21:9, meaning you can enjoy your ultrawide movies without the need for any black bars at all.